A missing woman. Hunters with a taste for human flesh. An immortal witch who can't be stopped. 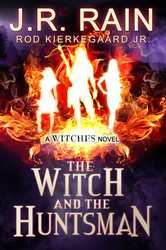 All in a day's work for witch and psychic, Allison Lopez. After Allison receives a call on the Psychic Hotline from Marisa, who says someone named The Huntsman is after her, Allison uses her skills of remote viewing to see that her caller is surrounded by snow. That is, until the line goes dead and so does their psychic link. On a hunch—and after getting suspended from work—Allison heads to the only ski lodge open in the summer, La Chasse Resort in Oregon to search for the mysterious caller. Once there, Allison gets a job as a server in the resort’s restaurant and uncovers more of the mystery. But to track down Marisa, Allison must use her supernatural talents and that of a triad of witches she’s connected to—but now someone is tracking her too. To complicate matters, Allison may have just found her dream guy. Has a powerful evil taken over the resort? When another employee disappears, it will take the power of three to fight it. Or will Allison also fall prey to the legendary Huntsman?